Cela roams around: Don't let go. Never give up, it's such a wonderful life. Don't let go. Never give up, it's such a wonderful life. It took 5 years. Six marathon runs. Thousands of kilometers, hours and hours of trainings. 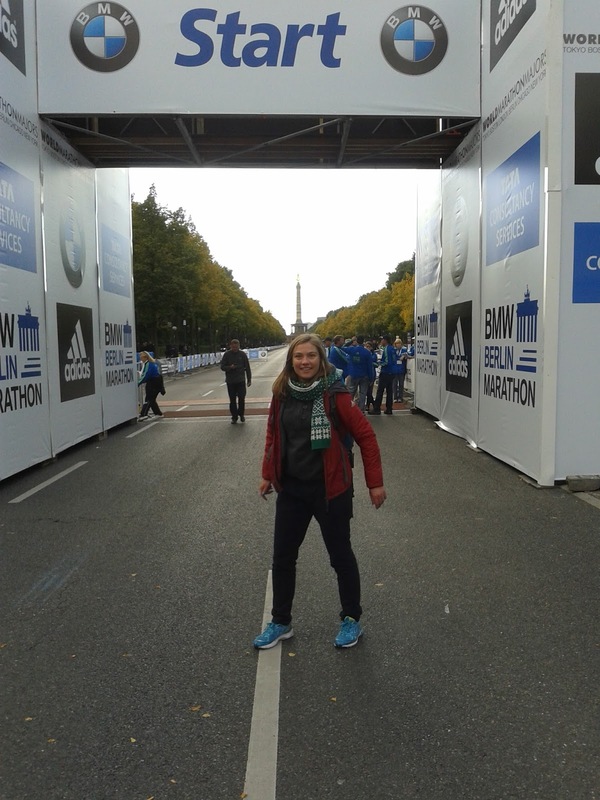 And finally on 30th of September, in 40th BMW Berlin Marathon I've managed to reach my aim. I was trying to go under 4 hours since the first run in 2009, but there was always something. Not trained enough, sick, tired, aching foot. 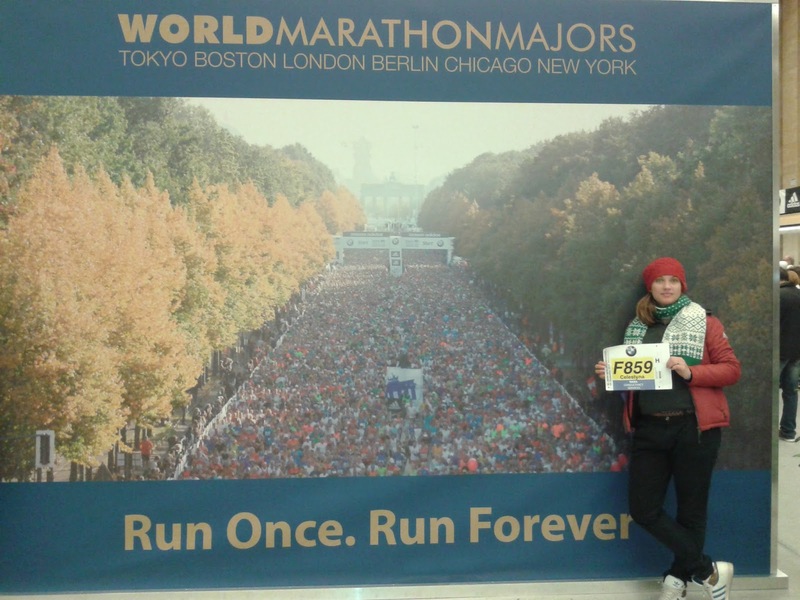 This time, even though I've given up even before the start, I've managed to finish the marathon in 3:56:49. I thought that I did not train well and hard enough. I'm also having very hard time in my private life, so I had the feeling that I'm mentally not prepared. 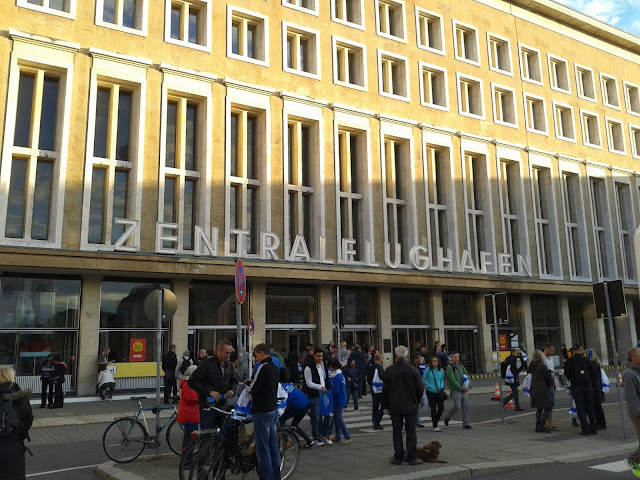 I went to Berlin with one of my friends. I've asked her to join me after L. with whom I was supposed to go left me. I would not be able to go there on my own, spend there four days hanging around there and being lonely. I was awaiting this event and that trip for almost a year, but when I've realised that he really means it my world and my plans has just fallen apart. I was even considering to give up and don't go there at all. Somehow I've managed to get myself together (for a while at least) and do some arrangements to go there. Like two years before we were arrived on Friday midday and were staying in Grand Hostel Berlin. Close enough to the city center and to the start and with affordable price. Friday and Saturday we've spent hanging around the city, picking up race numbers (what a line!) and visiting marathon expo. I was little bit disappointed with the goods that they were selling at the expo. I was not able to find anything that I'd really like and I was aiming to do some shopping there. I've ended up buying CompresSport Calf Guards that I've wanted to check up after the race (but of course forgot to take them with me at the day of the run). At the day of the run we woke up at 6 a.m. Breakfast in the hostel was at 6.30 so it was enough time to dress up and prepare deposit bag. At the breakfast there were also other runners, but we were missing the two lads that we met the day before. We were even wondering if they've just overslept, but in the end they've just skipped it. In the end I was not late, I've even started with corral G instead of H, which was good in the end. It exactly was my pace. I've started slower 5:55 and was not pushing myself at all, but was running about 5:40 all the time, some kilometers were even faster, so my average pace was getting lower. Legs were just leading me, no additional effort that I need to do. Is it that my morale went up as I was running the 1st kilometer with L? Or maybe the chance to see him on the finish line? The kilos that I've lost since? Don't know that one. Just know that I was really powerful and felt good till about 35-37 km. This was also the border line that i've set for myself. If when I reach there I still have a chance to beat 4 hrs I'm gonna push as hard as I can. And there was a chance. Huge chance even as my average pace at that time was 3:36, over 3 minutes ahead. Even though each next kilometer was more difficult I've decided that I need to keep that pace. When I was crossing k 41 the Hurts song Wonderful Life played in my headphones, that gave me some motivation (and I was already counting my steps to 10, and again) and then Varsovie by Brodka. I've crossed Brandenburger Gate with that song and finish line with the time of 3:56:49. Happiness. Euforia. Joy. L. at the finish line waiting. Km 8. I've caused a lot of swearing when I've stopped to take a picture. At that time I did not care (yet) how my pace is. 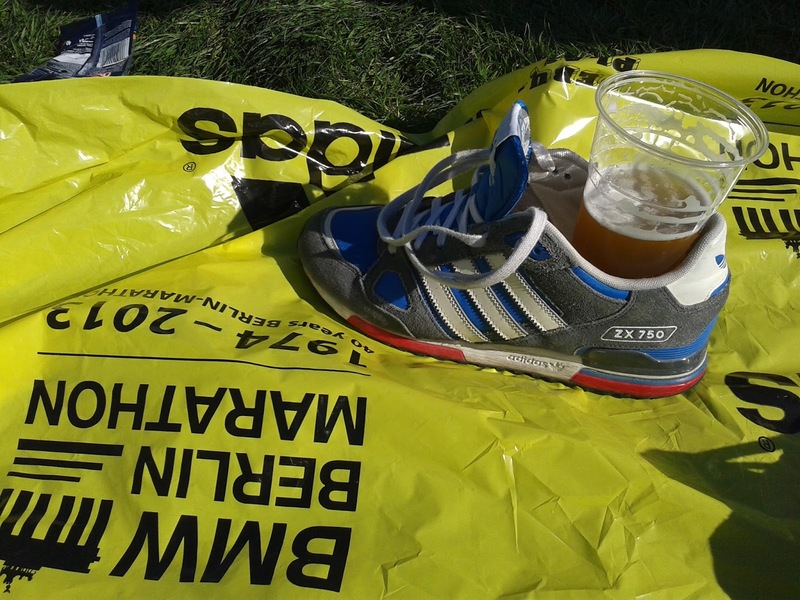 Shower, stretching, alko free beer, picnic on the grass, sun, the company that I was dreading to have. The most happy time for a month now. For how long will those 3 hours charge my battery? Monday was the day of the return. 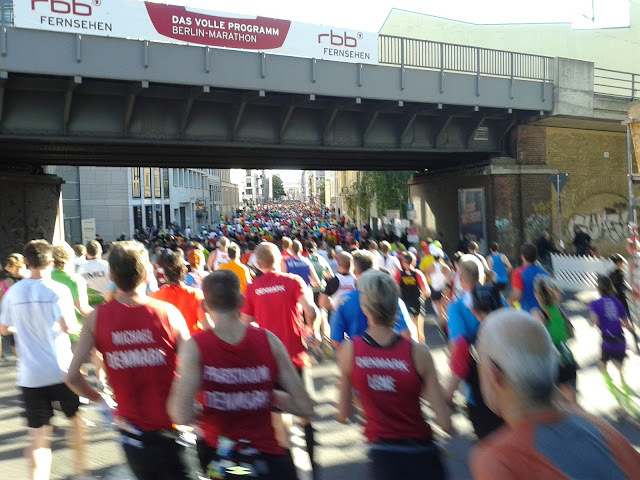 Whole train was full of runners, their families and friends. 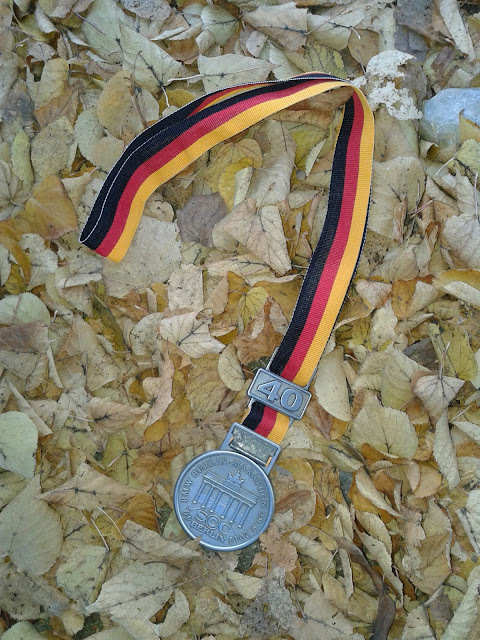 It was easy to recognise runners, still wearing their medals, blue or yellow bands, running shoes. Or carrying Berliner Morgenpost and discussing their achievements. That was really smooth and painless return to the reality. 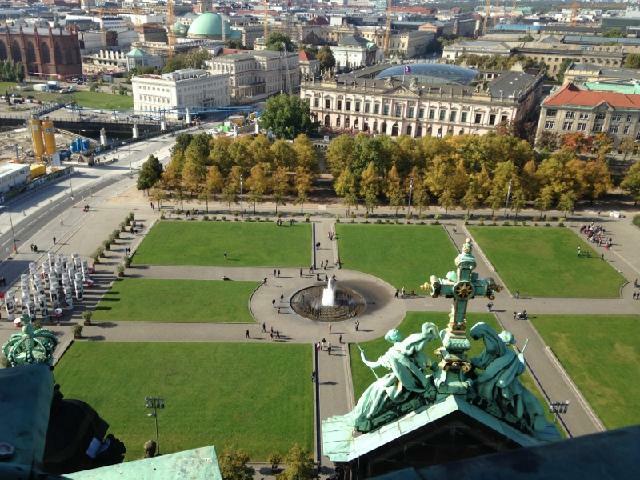 View from Berliner Dom. Try to spot me, I'm there.